When the United States was founded, only 40 percent of the people living within its boundaries spoke English as their first language. Today that number is 87%. For most of us, English is like the air we breathe: natural, given, right. However, language is rarely a given, a fact of which many groups are painfully aware. 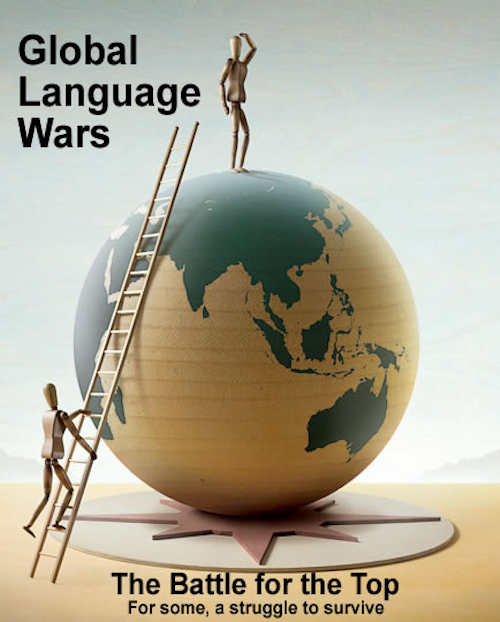 Language is a key battleground for national and cultural conflict. Most observers tend to explain political conflicts around the world as the result of racial, ethnic, religious, or territorial disputes; we rarely see language as a direct and fundamental cause. But if we reintroduce the category of language into our thinking about political conflict, it puts these clashes in a new light. As an example, in 1989, Slobodan Milosevic ordered Albanians to speak Serbian. They refused. This became one of the primary causes of the conflict. By some counts there are currently 6,700 languages in the world and only 225 nation-states. With most nation-states they understand the efficiencies of having a unifying single language. But any effort to move in that direction is met with a complex web of resistance among various language groups. When you mess with a person’s language, you mess with their heritage, their culture, their affinity with their ancestors. Changing language somehow invalidates all of the work of the past, disgracing the culture of their forefathers. When looking at past conflicts, it’s important to look at language as the source of tension: it is often more tangible than race or religion. For example, when you look at a person it can be very difficult to tell what race or ethnicity group they belong to. However, once they speak, much of the confusion disappears. Over the coming years, the number of languages spoken around the world will decline sharply. At the same time, the more vulnerable a group feels about their language, the greater their devotion to keeping it. As one of the most important elements of a culture’s identity, language is also incendiary. A group’s language can feel essential to its very existence. However, here is the turning point. English has become the de facto international language standard of science, technology, and the Internet. At the same time English has become the primary language of wealth and opportunity. As more and more information begins to accumulate around the English language, it creates a strange attractor, often for young people, around the world. Any person wishing to tap into the American wealth machine, by necessity, has to learn English. At the same time, people’s lives are becoming very busy. The pace of life is quickening. As people’s lives become busier, they have less time to pay attention to things that were important to their ancestors. The new, new language wars will be an inter-generational battle between the younger generations and their parents and grandparents. Thousand of languages will begin to disappear over the coming years because there will be neither the time nor dedication needed to preserve them. To some this will be viewed as a great loss to humanity. To others, it will just be regarded as part of the natural evolution of humanity.